As Director of PUPS, oftentimes, I think we could write a book about all the happenings that goes on within our organization, especially stories told by Dottie Smiddy, our volunteer foster care director. Every spring, she receives phone call after phone call about kittens in distress that are without their momma cat. She takes on what she feels she can handle, which, believe me, is quite a few! In the midst of kitten season, the message was staged: “Send Me No Flowers!” No one would help. No one! No one, but Dottie. Dottie came to the rescue, again! She agreed to take them all until the kittens were well enough and old enough to be adopted. Then, Momma Flowers and Momma Whiskers would be spayed…this is when the Doris Day Animal Foundation (DDAF) enters the picture. There was an important role for everyone. 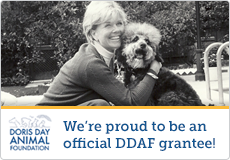 The Doris Day Animal Foundation was the producer that helped with the funding, P.U.P.S. directed the scenes played over and over again, and Dottie, the casting director, was the one who affectionately named and cared for the kittens. So thank you, Doris Day Animal Foundation for this new and important production of “Send Me No Flowers”! P.U.P.S. is dedicating many pages in their organization’s scrapbook with titles of movies that Doris Day starred in, i.e. “Pillow Talk” – kittens in slumber and play; “The Thrill of It All” – neuter/spaying free-roaming cats in two zip code areas of Clark County, Ohio; “With Six You Get Egg roll” – a blended family of pets; “It’s a Great Feeling” – helping hundreds of free-roaming cats in the small community of Clark County, OH…thanks to the generosity of The Doris Day Animal Foundation! Pictures are worth a thousand words and we will have plenty of pictures to support these themes. Please visit this site from time-to-time to see the development of our presentation scrapbook. Thanks to everyone who plays a role in the continuous production of “Pets Uniting People Society” (P.U.P.S.). Raffle for May is over. Raffle was for a shabby-chic 2-piece wall décor, beautiful planter, and gift certificate for Bonnie’s Garden Center. Raffle winner: John Ormsbee, Navistar, Dept. 59, Springfield, Ohio. Pets Uniting People Society (P.U.P.S.) is gaining on obtaining the goal of neuter/spaying 300 or more cats in 2014. News was received about another grant for our neuter/spay program. We thank The Ohio Pet Fund for their continued support. NOTE:This grant stipulates assisting low-income recipients according to the guidelines set up by The Ohio Pet Fund. Doris Day Animal Foundation to the Rescue Again for P.U.P.S. It was big news that Doris Day just had a birthday. Although it doesn’t always make the news about some of the smaller pet protection organizations like Pets Uniting People Society (P.U.P.S.) that her Doris Day Animal Foundation helps. We certainly appreciate that help. The P.U.P.S. Board would like to give a big shout out to Doris and her Doris Day Animal Foundation for their nonstop work in helping animals along with the people who love them. It is appreciated! Doris, we hope your birthday celebration was the best one ever! UPDATE: These kittens have been adopted. Check with Dottie for any new kittens. There are 10 kittens and all are so adorable. Dottie said it was difficult getting pictures as they run, jump, and play when she’s trying to capture some pictures. If interested in one, please message through our website or call or text Dottie at (937) 244-0852.